the Handbag Factory: DONT SCREW UP a Dj Screw retrospective. DONT SCREW UP a Dj Screw retrospective. Celebrating the orignator of slowed down, cut-up outsider music, Dj Screw. A one night only tribute to the origins of Chop and Screw. 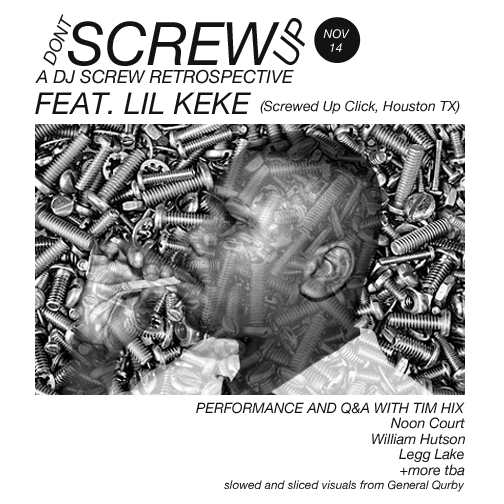 Featuring special guest Lil' Keke from Houston Tx, one of the last living members of Dj Screw's group -Screwed Up Click. Enjoy live, bizaare performances of local artist's interpretation of the slow and wierd.